Nature is an attractive source of new therapeutic compounds, as it represents a pool of secondary metabolites with tremendous chemical diversity. Currently about 60 % of the approved therapeutic drugs are derived from natural sources. These sources include various animals, plants, marine-organisms, and microorganisms [1, 2]. Among the different microbial sources, actinomycetes specifically are famous as producers of great number of unique and chemically diverse bioactive compounds. Actinomycetes are filamentous, gram-positive, spore forming bacteria . Members of the class actinomycetes are reported for the production of about 10,000 bioactive compounds among the total 23,000 bioactive secondary metabolites produced by microorganisms, representing 43 % of all bioactive microbial metabolites that have been discovered . Actinomycetes are also known as a rich source of potent antitumor compounds. Regardless of the presence of several therapeutic methods for the cancer treatment, cancer is still a major public health threat . Chemotherapy is one of the effective treatments for controlling cancer, but this approach needs a continuous supply of new antitumor compounds. Fortunately, one of the family members of actinomycetes known as Streptomyces helps us by providing promising antitumor compounds, which are unmatched and unrivaled in terms of treatment of cancer. The famous antitumor compounds produced by Streptomyces species and are being used in human chemotherapy includes actinomycin, mitomycin, anthra-cycline, bleomycin, aureolic acid families, pentostatin and resistomycin [6, 7]. Several studies confirm that Streptomyces are able to produce different antitumor compounds with diverse chemical backbones because they harbor different gene clusters encoding polyketide and nonriboso-mal peptide synthases . Most of these compounds are secreted in the culture media and can be extracted using organic solvents . There are many diverse mechanisms by which these compounds are able to control different tumor cells which includes apoptosis, mitochondrial per-meabilization, blockage of signal transduction pathways by inhibiting key enzymes, cytomorphological changes due to disturbance in cellular differentiations, and tumor induced angiogenesis . Sometime antitumor compounds isolated from Streptomyces strains act by intercalating with duplex DNA, which leads to detrimental effects on fast proliferating cells by inhibiting the DNA-dependent RNA polymerase activities . In order to establish a unique pool of Streptomyces strains that can be examined for new anticancer drugs, we focused on gathering strains from unique habitats and conducting target directed biological screening [12, 13]. Among different habitats, normal terrestrial habitat is the most explored one, while there are very few studies conducted on extreme ecological niches, like forests, salt stress areas, hills, desert etc. . Our aim from both of these strategies is to attain novelty in biological activities and chemical structures. To this end, the present study reports the isolation of a Streptomyces strain, KML-2, from the Khewra salt mines in Pakistan. Culture extracts from KML-2 exhibited potent cytotoxic activity against Artemia s. larvae and antiproliferative activity against three cell lines. These activities inspired us to isolate the bioactive molecules and determine their structures and bioactivities. Phylo-genetic analysis was performed by conducting ribotyping studies of the strain KML-2. In order to meet the increasing demand for the treatment of human illness, new biologically active metabolites are needed. In this battle microorganisms are generally, and in particular actinomycetes, are prominent producers of chemically diverse compounds with multiple activities. However after several decades of extensive screening it has become difficult to simultaneously find novel compounds and novel microorganisms. Despite of this fact, there are some unique ecological niches in the world which are unexplored and could be a source of novelty, both for the microorganisms and their compounds. In our case we selected a unique and untapped source for the isolation of actinomycetes, the Khewra salt mine, which is the world's second largest salt mine, located in the province Punjab, Pakistan . Recently few studies report the isolation of novel actinomycetes strains from salt rich environments [16-18]. Several soil samples were collected from the mine and plated on the selective media after making suitable dilutions. After incubation actinomycetes strains were isolated and purified on GYM agar. 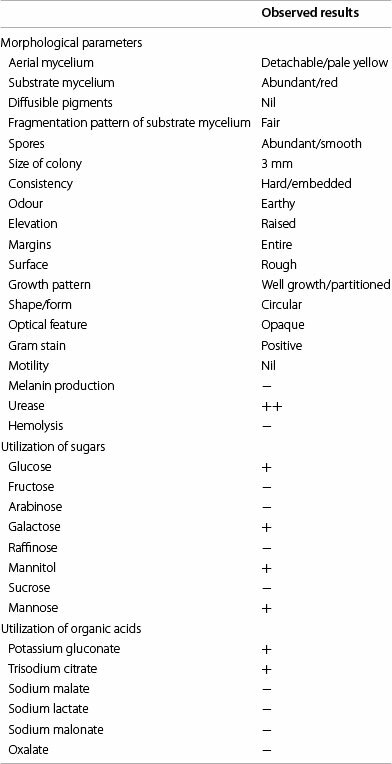 The strain KML-2 exhibited typical Streptomycetes like characteristics (Table 1). Individual colonies grew well in an elevated manner with red vegetative mycelia and yellow aerial mycelia. As depicted in the scanning electron microscope image, the spore chains were straight, smooth, thick, and branched with very little coiling. The diameters of the spores are constant with having connection to substrate mycelia (Fig. 1a-d). 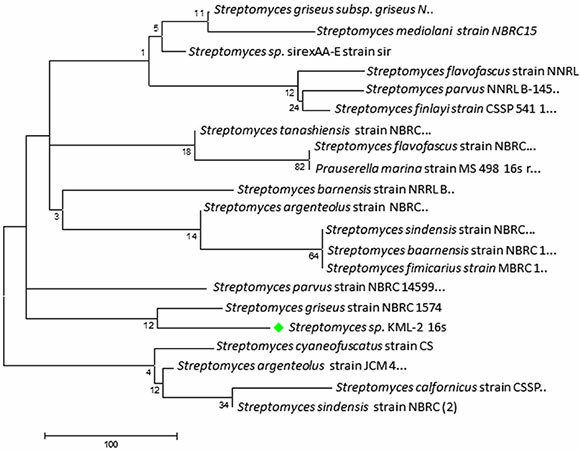 All of the morphological and surface parameters observed under scanning electron microscope are in close similarity with family known as Strep-tomycetaceae and the genus Streptomyces. The comparison of biochemical, physiological and microscopic characteristics (Table 1) with those of known actinomycetes species mentioned in Bergey's Manual of Systematic Bacteriology strongly suggested that the strain KML-2 belongs to the genus Streptomyces . It can utilized D-galactose, D-glucose, mannose, glycerol and man-nitol as a carbon source indicating its ability to grow on variety of sugars. The strain tested negative in biochemical tests like hemolysis and melanin production. Out of several organic acids tested for utilization, the strain KML-2 utilized only potassium gluconate and trisodium citrate (Table 1). Several molecular techniques are being used in the research for investigating the evolutionary relationship among isolated microorganisms. By the help of these kinds of molecular techniques we can easily verify the hypothesis generated from other characterization methods like physiological and biochemical tests . Among all the techniques ribotyping is very commonly used one, in which 16S rRNA gene sequence data of the isolated strain is compared with the sequence data present in the Genbank database. In our case we are able to sequence total nucleotide of 1437 bp (Accession No: KJ009562) of the 16S rRNA gene of Streptomyces sp. KML-2. The BLAST analysis was performed by aligning this sequence with the 16S rRNA gene sequences present in the Genbank database. Blast results exhibited highest similarity (99 % similarity) with the 16S rRNA gene of Streptomycesgriseus (Fig. 2). A significant challenge in isolating bioactive compounds from microorganisms is having an appropriate and sensitive bioassay to guide the purification process . In our case we screened extracts from Streptomyces sp. KML-2 using several bioassays in order to exploit its full chemical potential. We started with measuring the cytotoxic effects of the crude extract of this strain against the larvae of Artemia s. commonly known as brine shrimp . 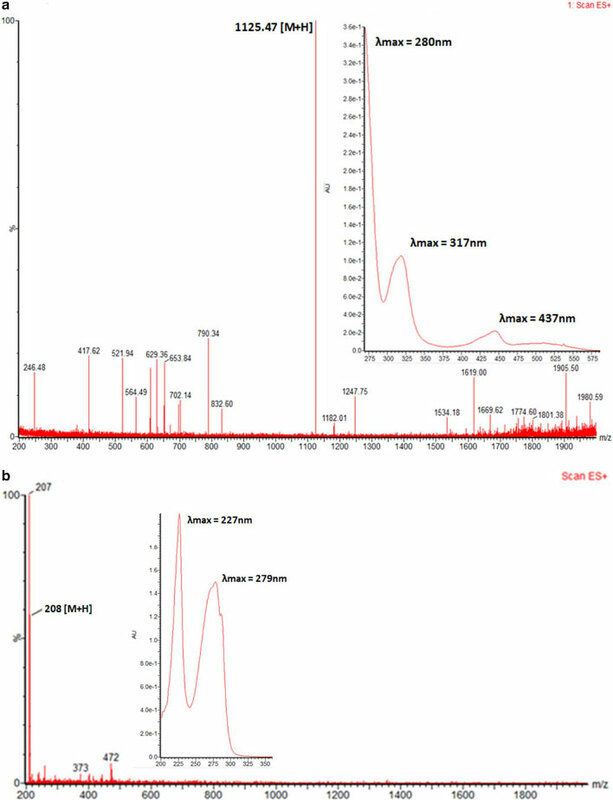 The cytotoxic profile of the crude extract from Streptomyces sp. KML-2 showed very promising results. This strain produces compounds which have the ability to inhibit 84 % of the growth of Atremia s. larvae. The high cytotoxic response against Artimia s. suggests that the extract of this strain might contain some potent antitumor compounds. We then selected the MTT assay to test the antitumor activity of this strain against Hela cells (cervical cancer) and two normal cell lines including MDBK (cow kidney epithelial cells) and Vero cells (African green monkey kidney epithelial cells). We observed differential antitumor activity against tested cell lines in a dose-dependent manner. The survival rate of Vero and MDBK cells is higher compared to Hela cells. IC50 values for Hela, MDBK and Vero cells were 12.17, 47.88 and 56.12 μg/ml respectively. Such differential behavior with several normal and cancer cell lines including Hela were observed for the extracts and pure compounds isolated from different Streptomyces species in several studies [23-27]. These data indicate that the MTT assay utilized in our study is suitable for screening antitumor agents with high cytotoxic activities. No significant antibacterial activity was seen when the extracts was screened against the general panel of gram positive and gram negative bacteria. Later on after isolation and purification, the antitumor activity of two pure culprit compounds was also evaluated by using MTT assay. Initially antitumor potential of the compound 1 and 2 was checked against Hela and MCF-7 (breast cancer) cell lines. It is observed that both compounds showed significant antitumor activity against both cell lines with IC50 value of 8.9 and 7.8 μg/ml against Hela cells respectively. Activity of compound 1 against MCF-7 is also significant with having IC50 value of 12.6 μg/ml, but compound 2, which was found novel in terms of source and activity after performing structure elucidation experiments, shows marvelous antitumor potential against MCF-7 cells with having IC50 value of only 0.97 μg/ml (Fig. 3). The 20 l shaking flasks culture of the isolate Streptomyces sp. KLM-2 was extracted using Diaion HP-20 beads and 1.5 g red color crude extract was obtained. Two different compounds were separated by preparative TLC. The compound 1 is yellow in color with λmaxat 437, 317 and 280 nm. After that this pure compound was analyzed on UPLC/MS system and m/z ratio of 1125.47 [M + H] + was observed in positive ES mode. This value, along with the distinct absorbance spectrum is consistent with already reported compound named as Chromomycin SA having Chemical formula: C54H76O25, Exact mass: 1124.47, Molecular weight: 1125.17, Elemental analysis: C, 57.64; H, 6.81; O 35.55 (Figs. 4a, 5a). Results of 1H-NMR experiment for this isolated compound confirmed its identity as Chromomycin SA (Additional file 1: Table S1). Chro-momycin SA is a yellow color compound produced by Streptomyces griseus, already reported for a potent activity against Hela cells . Our phylogenetic, morphological and physiological analysis also confirm that our strain have 99 % similarity with S. griseus. Chromomycin SA belongs to the class of polyketide compounds known as aureolic acids. Aureolic acid family contains potent antitumor compounds which inhibit the replication and transcription process during macromolecules biosynthesis. They also interact with the minor groove of DNA in GC-rich region. This binding is non-intercalative in nature, via cross linking of DNA in the presence of Mg2+ . Previously Menéndez et al. reported isolation of Chromomycin SA from a S. griseus strain that has been genetically altered specifically through the inactiva-tion of ketoreductase gene (cmmW1). Later on Hu et al. reports the isolation of Chromomycin SA without introducing any mutation in ketoreductase gene. They proposed that Chromomycin SA is byproduct in nature, formed during the synthesis of different analogs of Chromomycin SA. They have isolated the S. griseus strain from saline environment which is also similar in our case. So we can hypothesized that might be there is some relation between inactivation of ketoreductase gene and stress acclimatization. Latest studies have also introduced the new term known as ecovars, in which strains of S. griseus might be undergoing ecology-specific evolution, which results in the genetic variation with the specific ecology . Compound 2 with m/z 208 [M + H]+ was purified by column chromatography over silica gel with the Metha-nol: Dichloromethane solvent gradient system and Sephadex LH-20 column. After purification 6 mg of pure compound was obtained. Structure of this pure compound was determined through Bruker Avance 600 MHz NMR spectrometer. After performing several two dimensional NMR experiments compound 2 was identified as 1-(1//-indol-3-yl) propane- 1, 2, 3-triol (Fig. 4b), one of the derivative of indolic compounds (Additional file 1: Table S2) with Chemical formula: C11H13NO3, Exact mass: 207.09, Molecular weight: 207.23, Elemental analysis: C, 63.76; H, 6.32; N, 6.76; O, 23.16. 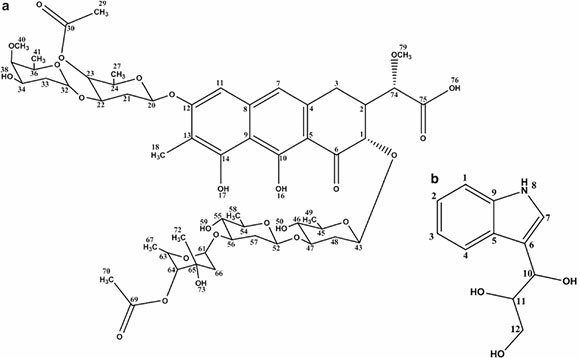 To the best of our knowledge this type of indolic derivative has not been reported earlier from Streptomyces source, however one study depicted its isolation from clavicipitaceous fungi Balansia epichloe (B. epichloe) with high toxicity against fertile chicken eggs . Earlier only fungus is reported among natural sources for the production of this type indolic derivative but now some studies also reports its chemical synthesis . Several actinomycetes strains were reported for the presence of tryptophan metabolism gene clusters, which are responsible for the production of different indolic derivatives . As shown in Fig. 4b 1-(1W-indol-3-yl)-propane-1,2,3-triol has λmaxat 227 and 279 nm, which is very common among different derivatives of indoles which are reported for having promising antitumor activity against several different tumor cell lines . From this research work we were successful in isolating two potent antitumor compounds from Streptomyces KML-2 strain. From the results we can inferred that the strain Streptomyces KML-2 is potent source of antitumor agents. This study also reveals that Khewra salt mine from where the strain KML-2 was isolated is a potent ecological niche with having inimitable strain diversity which are yet to be discovered. In short these unique habitats should be continuously explored for extracting lead antitumor compound. Furthermore we will try to check the activity of isolated compounds against different cancers including colorectal and liver cancers, which are present in very high intensity worldwide and specifically in Pakistan. Soil samples were collected from Khewra salt mines, Punjab, Pakistan, in sterile sampling bag, from the depth of 5-10 cm, quantity of each of the collected sample was between 2 and 5 g. The samples were then treated using different physical and chemical methods for the enrichment of actinomycetes. In physical treatment the samples were kept at high temperature (55 °C) for 2-3 weeks and in chemical treatment soil samples were mixed with CaCO3 at the ratio of 10:1 and were incubated under moisture rich conditions for 7 days at room temperature . Actinomycetes strains were isolated using selective isolation media Glycerol-Casein-KNO3 agar (glycerol 10 g, KNO3 2 g, casein 0.3 g, NaCl 2 g, K2HPO4 2 g, MgSO4- 7H2O 0.05 g, CaCO3 0.02 g, FeSO4-7H2O 0.01 g, agar 18 g, all in 1 l) containing cycloheximide (50 μg/ml) as antifungal agent . About 1 g of soil was dissolved in autoclaved distilled water and serial dilutions (10-2 to 10-4) were plated on Glycerol-Casein-KNO3 agar. The plates were incubated for 7-21 days at 28 °C. The actinomycetes colonies were selected and purified by repeated sub-culturing on GYM agar (10 g malt extract, 5 g yeast extract, 5 g glucose, 15 g agar, all in 1 l of tap water) . Later the selected isolates were preserved in liquid nitrogen for future use. The morphologic, biochemical and physiological characteristics of the isolate KML-2 were studied by the methods employed in International Streptomyces Project (ISP), including colony size, consistency, shape, elevation, margins, color of aerial/substrate mycelium, pigments diffusing into the medium, formation of melanin, utilization of different sugars as sole source of carbon, utilization of organic acids, hemolysis, utilization of oxa-lates, optimum pH, temperature, aeration, media composition [37, 38]. In order to see the deep morphological pattern (substrate & aerial mycelia) of strain KLM-2, scanning electron microscopy was performed . The strain was grown on GYM agar and a piece of agar containing sufficient growth of the strain was cut with sterile scalpel. The strain was fixed with glutaraldehyde (2 %) and formaldehyde (5 %), and then incubated at 4 °C for overnight in 0.1 M sodium cacodylate buffer (0.1 M cacodylate, 0.01 M CaCl2, 0.01 M MgCl2, 0.09 M sucrose; pH 6.9). After overnight fixation, the strain was washed with fresh cacodylate buffer. The strain was then dehydrated with a series of acetone solutions (10, 30, 50, 70, 90, and 100 % acetone). After acetone dehydration, the agar piece containing growth was subjected to critical-point drying with liquid CO2. Before loading the agar piece in the scanning electron microscope (SEM) it was covered with a 10 nm thick gold film by sputter coating (Hummer-V Sputter Coater). After coating, deep morphological patterns of the substrate mycelia of strain KML-2 were analyzed by using scanning electron microscope (HITACHI S-2300 SEM at Electron microscopy facility, Queens University, Canada). Total genomic DNA was isolated after growing the stain in GYM broth. Genomic DNA was extracted by the phenol/chloroform method as described by Hopwood et al. . The 1.5 kb 16S rDNA fragment was amplified by PCR using the universal primers 27F, 5'-AGAGTTT-GATCCTGGCTCAG-3' and 1522R, 5'-AAGGAGGT-GATCCARCCGCA-3'. Each PCR reaction vial contained approximately 300 ng genomic DNA, 2 μl of each primer having working concentration of 10 pmol, and 25 μl of 2X PCR master Mix (Merck-GeNei™). The reaction was cycled as follows: 94 °C for 5 min; 30 cycles of 94 °C for 20 s; 50 °C for 20 s; 72 °C for 2 min; followed by 72 °C for 5 min. After amplification, the reaction product was resolved by agarose gel electrophoresis and gel purified using a MiniElute™ PCR purification kit (Qiagen, USA). The gene product was sequenced using dye terminator chemistry on an automated sequencer (ABI-PRISM® BigDye® Terminator version 3.1 Cycle Sequencing Kit, Applied Biosystems, USA), and the sequence data was compared to existing sequences by BLAST analysis (http://www.nih.nlm.gov/blast.cgi). After analyzing BLAST results, phylogenetic and molecular evolutionary analysis were conducted using software MEGA (version 4) . The sequence was then deposited to the NCBI GenBank. The Streptomyces strain KML-2 was grown in 250 ml GYM broth in 1 l Erlenmeyer flasks (the pH was adjusted to 7.8 before sterilization). The flasks were then incubated at 28 °C at 100 rpm for 5-7 days. After incubation the cells were disrupted by sonication. The resulting broth was mixed with ethyl acetate 1:1. The mixture was sonicated again and the upper organic layer of ethyl acetate was collected in a separatory funnel. The organic layer was evaporated on rotary vacuum evaporator (Heidolph® 4000 efficient) and a small amount of crude extract was obtained. The crude extract was analyzed for cytotoxic and antitumor activities against different cell lines. where, M = Percent of the dead larvae after 24 h, A = Number of the dead larvae after 24 h, B = Average number of the dead larvae in the blind samples after 24 h, N = Number of the dead larvae before starting of the test, G = Total number of larvae. Antimicrobial activity of the extract obtained from the culture broth of Streptomyces sp. KML-2 was determined by disc diffusion method as described by Sajid et al. against a set of test organisms including Bacillus subti-lus, E. coli (ATCC 25922), Staphylococcus aureus (ATCC 25923), Methicilin resistant Staphylococcus aureus (MRSA), Acinetobacter, Pseudomonas aeruginosa and klebsiella pneumonia (ATCC 706003). A starter culture was prepared by inoculating 25 ml GYM broth with the strain KML-2 and incubating at 28 °C for 4 days at 95 rpm. Fermentation was done in ten 5 l EM baffled flasks containing springs and glass beads. Each flask contained 2 l GYM broth for a total working volume of 20 l. Antifoaming agent 204 (Sigma Aldrich), 100 μl/l, and 2 % (v/v) inoculum was added to each flask. The cultures were incubated at 28 °C for 7 days at 95 rpm. After 7 days the culture broth was harvested by centrifu-gation at 11,000 rpm for 5 min at ambient temperature. After centrifugation, the liquid phase was separated and Diaion® HP-20 beads (Sapelca analytical USA), pre-washed three times with acetone and air dried overnight, were added at a ratio of 10 g/l. This mixture was incubated for 3 h on a rotary shaker at 100 rpm, and then separated by vacuum filtration. The beads were washed with water 2-3 times followed by three times washing with acetone. The acetone was removed under vacuum to dryness. The solid phase or cellular mass was also extracted three times with ethyl acetate and the solvent was evaporated under vacuum to dryness. The combined crude extract (extract from liquid as well as solid phase) was fractionated on silica gel column (25 χ 5 cm, Silica gel 60, Merck). The fractions were purified by repeated silica gel column chromatography and preparative TLC (PTLC) with a mobile phase of CH2Cl2/ MeOH gradient. Final finishing of the purified compounds was done by passing the fractions through Sephadex LH-20 column. The structures of the purified compounds were analyzed through UPLC-mass spectrometry and NMR spectroscopy. The data obtained was compared with reference data present in databases including: Dictionary of Natural Products (DNP), Pub Chem, Scifinder and Chemical abstracts. Compound 1 and 2 were isolated and characterized by UPLC-MS and NMR spectroscopy. For UPLC-MS analysis samples were prepared carefully by dissolving the powder compound in 500 μl methanol. Furthermore this methanolic compound mixture was five times diluted in 50 % acetonitrile. The diluted samples were then filtered through 2 μm pore size disposable syringe filters and further centrifuged at 14,000 rpm in order to remove any particle. Samples were then transferred to special LC-MS glass vials which were further placed in the sample tray of UPLC-MS machine. 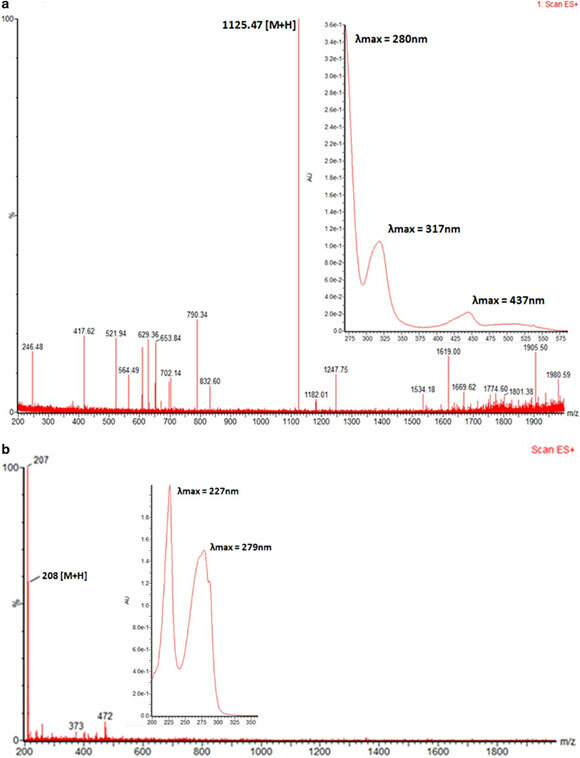 The analytical conditions for the UPLC-MS analysis were as follows: Waters ACQUITY UPLC H-class BEH-C18, (2.1 χ 100 mm; particle size, 1.7 | m) column; Column temperature: Ambient; Gradient Elution: A is Acetonitrile, B is Acetoni-trile + 0.5 % acetic acid, C is MilliQ water + 0.5 % acetic acid, D is MilliQ water; Gradient Profile: 0-1.5 min 5 % B and 95 % C, 1.5-7 min is 95 % B and 5 % C, 7-10 min 95 % B and 5 % C, Before and after run column was re-equilibrate by eluting with 100 % A and B; Flow rate: 0.5 ml/min; m/z monitoring range 200-2000 m/z ratio; Wavelength monitoring range 220-800 nm; Total run time: 10 min; Data: Continuum; Seal wash period: 5 min; Waters SQ detector mass spectrometer; Ionization mode: ESI positive; Scan Duration: 0.5 s; Capillary voltage, 3.3 kV; Cone voltage ramp: on; Source temperature: 150 °C; Desolvation temperature: 400 °C; Desolvation gas flow: 800 l/h; Cone voltage; 0 V; Desolvation gas: liquid nitrogen; Mass lynx software V 4.1 (waters). Structure of the compounds were elucidate on Bruker Avance 600 MHz NMR machine by using simple 1D and 2D NMR spectroscopic techniques for 1H- and 13C. Several techniques including COSY, HMBC, HSQC and NOESY were also performed for the correct structure elucidation in the 2D NMR spectroscopic analysis. UA carried out the whole research studies, including cell culturing experiments and drafted the manuscript. DZ participated in the Mass and NMR spectrometric analysis. IS participated in the design of the study and performed the statistical analysis. All authors read and approved the final manuscript. We are thankful to Higher Education Commission (HEC) Pakistan for financial support under IRSIP Scholarship Program for the completion of this research work. We are also thankful to Dr. Frangoise Sauriol for her help regarding NMR experiments and XiMing Zhu for mass spectrometry analysis.